Everyone loves a perfect marriage of form and function — even in a water bottle. There are plenty of awesome reusable water bottle companies out there, but SIGG is one of the best… hands down. These Swiss-made water bottles are stylish, BPA-free, phthalate-free, and come in a staggering number of styles. I’ve had 3 different SIGG water bottle styles (2 of which I bought, and 1 that SIGG sent me to review). 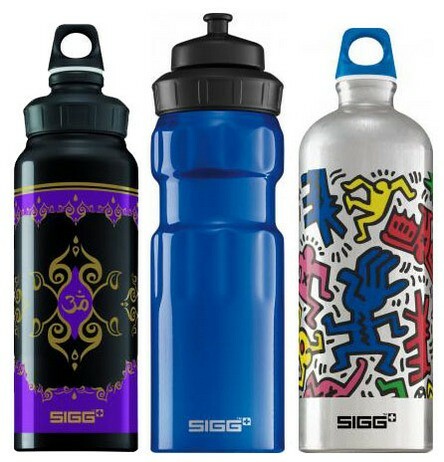 So let’s take a look at the SIGG wide mouth, wide mouth sport, and traditional designs. I’m gonna come right out and say it, the wide mouth versions are my favorite. The wide mouth SIGG water bottles aren’t just wide mouth, they have a dual lid that can also be used as the narrow mouth bottle as well. As you can see in the above picture, the narrow lid is nested on top of the wide mouth lid… which is genius. Why is this such a genius water bottle design? Unscrew the wide-mouthed part of the lid to make filling, adding ice, and cleaning the water bottle much easier. When you go to take a refreshing sip of water, choose which section of the lid to unscrew depending on if you’d like a flow or a gush. Another interesting feature of the SIGG water bottle lids is that they are interchangeable. The small lid of a traditional style will fit right into the narrow lid section of the wide-mouth bottle. The sport bottle top is dual threaded and will fit either the wide-mouth water bottles or the traditional bottles. Why does having interchangeable lids matter? How many times have you found yourself in a hurry only to be fumbling through your kitchen drawers looking for the right top to your water bottle? If you owned several SIGG water bottles, regardless of which versions they might be, any lid will fit any bottle. No more lid hunting. Many people think that they are helping the environment by refilling their plastic PET water bottles. But are you helping yourself? Disposable PET bottles are designed for one time use,» states Simran Sethi of The Discovery Channel. Refilling them can release harmful toxins from the packaging – especially when it gets heated. If you’re tasting plastic, you’re ingesting plastic. A SIGG Bottle is your healthy and safe choice for your body. The baked-on, crack resistant bottle liner makes sure that you drink what you want to drink – and not unwanted chemicals. The SIGG bottle liner is leach-proof and resistant even to energy drinks, fruit acids and carbonation. On top of the safety benefits from the aluminum construction, SIGG has never used BPA or phthalates in the lining of their bottles… and that’s something not every bottle manufacturer can say. Whether you’re looking for a trendy and funky design, a sport bottle, an easy to clean bottle, a kid-friendly bottle, or a plain old water bottle, SIGG has a water bottle that will probably suit your needs. Most of their water bottles range in price from $20 to $30, so some people may find that’s a little more than they’d like to spend on a water bottle. What type of water bottle do you use?